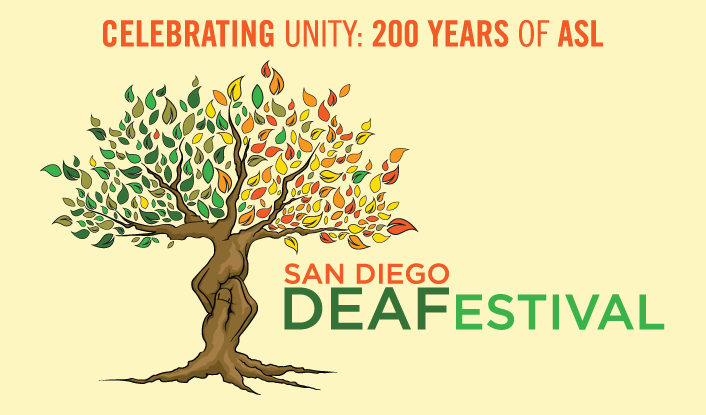 Once a year, San Diego brings the Deaf community together to celebrate Unity Day. The Deaf Festival took place on Saturday, Oct. 7 at Jacobs Center for the second year in a row. Unity Day is a fun, free event for the Deaf and a great way to celebrate 200 years of American Sign Language. As an individual learning ASL, it is a great way to immerse myself in the culture and practice my signing. It can be intimidating, but the community is welcoming to all ASL skill levels. This is the perfect place to find comfort and friendship in people who have similar experiences or backgrounds within the Deaf community. This event serves to bring awareness about opportunities and services for Deaf and hard-of-hearing people. There are lots of different organizations that table, from within the San Diego county and outside. Along with these opportunities, there were tables selling shirts reading “I love ASL,” and endless trinkets to show love and appreciation for the Deaf community. There are also activities for people of all ages. There were free caricature drawings, a rock wall and fun workshops to take part in. Well-known groups were brought in for the event, such as Deafinitely Dope, Two Worlds, and Hedy and Heidi. The crazy warm weather didn’t stop a great turnout for the event. Shaved ice was being sold to keep you cool as you walked among the tables outside. Inside Jacobs Center was the main stage where Chris Corrigan could be found hosting Unity Day. He was the MC for the event in the previous years and shows sincere passion for the community. Deafinitely Dope is a duo who aims to unite the Deaf and hearing communities through music. Mathew Maxey brings the music to life with such vibrant personality in his signing. And, there was a meet and greet opportunity after Deafinitely Dope’s event. Fun Fact: Mathew Maxey is now interpreting for Chance the Rapper! Another exciting performance was given by the Israeli dancers Two Worlds. This married couple brings to life a captivating interpretive dance. The husband is Deaf, while his wife is hearing. She learned to sign after meeting him. Together, they make a great team and captivate their audiences through their dancing. Leaving this event, I realized what an impact it had on me. It is truly captivating to see a community come together and share their beautiful language with one another. While I was not brought up in an environment filled with ASL, it’s a beautiful experience to share little moments with people and show you want to communicate with them. I wish everyone would take the extra step to learn a few signs and communicate with their fellow neighbors and coworkers who are in the Deaf community. That extra step to understand someone makes all the difference in the world.